Give the Gift of a Hug with a Donation to Hug Wraps! 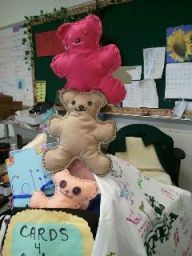 “Bear Hugs” hand-sewn by area students! Donate a percentage of our Hug Wraps® made to local cancer hospitals. Create I.V. Pole Cover & tote Bags to enhance the dreariness of a cancer patient’s room. Spread Love to young children in cancer wards. We use any left-over fabric to create lap blankets, pillows and pillow cases for young children at no cost to the families. Partner with teen youth in our area who hand-sew “Bear Hugs” with left over fabric which are then distributed to young cancer patients along with hand made cards from the teens. Donate pillows created from left-0ver fabric to long-term care facilities, Hospice centers and other treatment facilities. As a small not-for-profit, YOUR DONATION MATTERS greatly in supporting our vision of giving cancer patients back their dignity during a difficult time in their lives. You can make a DONATION in the name of a LOVED ONE which will be posted on our “Supporters…” page. Hug Wraps® processes your payments on Paypal’s secure server and accepts all major credit cards. To make an online contribution just click on the donate button below. If you would like to make the donation in honor of or in memory of a special person, please include that information in the Paypal form. Thank you for your support of Hug Wraps®!